Hannah's daughter Elizabeth MARKHAM married Robert KNIBBS c1866 in the Woodstock District of Oxfordshire, England. 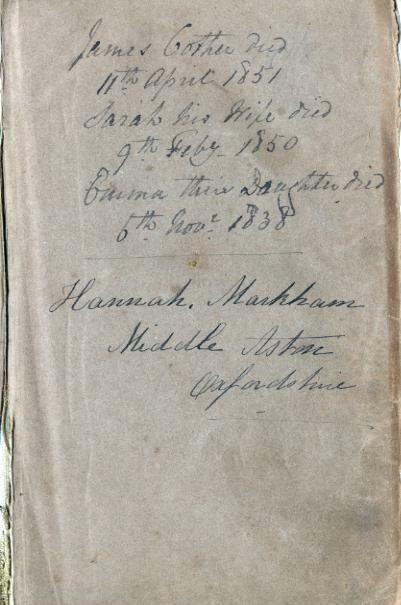 I believe Hannah was the first owner of this Bible which has passed down through the family. It has the date Feb 1834 stamped inside the front cover. The names and dates above Hannah's name relate to a James Cother, his wife Sarah and daughter Emma. We're not sure of the connection but know that there were farmers named Cover living in the same area. There was no known family connection, so we suspect it was a working relationship between the two families. The names on the second page refer to the marriage of Hannah's grandson James KNIBBS to Sarah CASEBROOK, and the birth of her great-granddaughter Phillys Eveline to another of her grandsons, George Levi KNIBBS. I suspect that these latter entries were made after Hannah had died.